You are here: Home / How to adjust pressure cut off IR 375? How to adjust pressure cut off IR 375? Recently replaced pressure tank filter to resolve blotter test issues (oil in the blast air) and it fixed the problem. I want to set the performance pressure to 145psi. Currently, I have to keep the air outlet valve open to prevent the pressure release valve from popping off at max pressure on the gauge (150psi) and spraying hydraulic fluid everywhere. 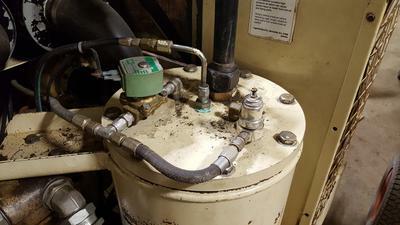 How do I adjust the pressure cutoff, and is there anyway to test the electronic pressure sensor located near it in the same line on top of the hyd/air pressure tank? Before getting to that, have you cleaned the PRV ? If not, it’s almost certainly popping prematurely. The pressure sensor is just a pressure sensitive resistor, so the easiest way to check that is with another gauge on the separator tank or receiver. I have previously replaced the PRV (150psi), as this was my first line of resolution. I know that the valve on the right in the pic above, is the cutoff adjustment, just wondering what the proper procedure for adjustment is, as I have adjusted the top screw in and out, resulting in no change of the compressor shutting off at a lower pressure than that of the PRV. Is there a technical name for this “pressure adjustment valve” that I am not aware of? If I knew that, it is possible that I would be able to purchase a new one, assuming the current one has worn out. I think perhaps the reason the adjustment is not working, and given that you have to leave the outlet open, means that the thing is not loading/unloading properly, as in the load valve is stuck. Thanks so much! I’ll check the unload valve and go from there.